Max Bense was a significant supporter and theorist of early computer art. 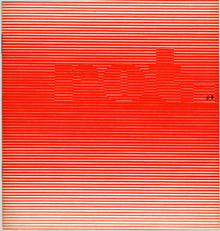 This webpage »red 40+1« displays the early editions of the »rot«-brochures, a series of publications that was started in 1960 by Bense and his co-editor Elisabeth Walther. Max Bense (1910 - 1990) was professor of philosophy and technology at the TH Stuttgart and a major developer of the information aesthetics, providing a theoretical fundament for early computer artists. In his work he connected natural science, art and philosophy. He was the driving force of the Stuttgart School/Group, which was devoted to experimental literature, especially visual and concrete poetry but also art in general. Read more on the Stuttgart School and on Max Bense online at www.stuttgarter-schule.de (in German), e.g. a text by Reinhard Doehl on Stuttgarter Schule. Many »edition rot«-numbers - the earliest are on display here - contain experimental texts. But, as Reinhard Doehl describes, the numbers of the »red edition« were »slightly expanded catalogues of the exhibitions (...) Bense had been organizing in the (...) Studien-Galerie since the late 50s« which were »simply "camouflaged" by a cover«. As mentioned, Bense was a major supporter of computer art. He enabled the first exhibition displaying computer art 1965 in Germany, which was most likely the first show of this kind worldwide. In February 1965 the mathematician Georg Nees presented his computer graphics at the gallery of TH Stuttgart for the first time. No surprise that some texts important to computer art can be found in the »edition rot« edited by Max Bense and Elisabeth Walther in German. Besides #6, a publication which includes two early computer-generated texts in German, the most important editions are the German translation of Abraham A. Moles´ »First Manifesto of Permutation Art«, #8, and computer graphics by Georg Nees with a text on generative aesthetics by Max Bense in #19. In 1961 Max Bense published #6, where he presented experimental texts and poems (in German) describing their model character, among these were two computer-generated texts generated by the main frame computer ZUSE Z22 in Stuttgart, Germany. See the ZKM-clip ZUSE Z22 on youtube. These two computer-generated texts are a stochastic text programmed by Theo Lutz and a Markovian text. The Markovian text was created with statistical convergence and probability calculations according to the Markov chain. The data/words used were taken from a dictionary of frequent words in Francis Ponge´s books (German editions), which was assembled by Elisabeth Walther and the team of the Stuttgart computer center. Monika Bense conducted the technical realization of the literature-experiment. Abraham A. Moles (1920-1992) was a French engineer with a doctor´s degree in physics and philosophy. Among other colleges and universities he held lectures at the TH Stuttgart and was professor at the university for design, the Hochschule fuer Gestaltung in Ulm, Germany. Like Bense, Moles worked on information theory and aesthetic perception. His »Théorie de l'information et perception esthétique«, first released in 1958, is seen as a fundamental writing of the information aesthetics. »rot #8« is the first German edition of his manifesto. 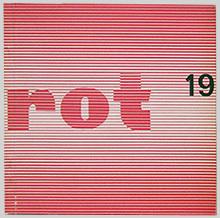 »rot #19« is one of the earliest publications on computer art. The brochure refers to the computer graphics exhibition initiated by Max Bense, the first known show of computer art world wide: Between February 5th and 19th the Studien-Galerie, a gallery at TH Stuttgart, presented computer graphics by Georg Nees, a mathematician. Together with A. Michael Noll and Frieder Nake, Nees is one of the pioneers of computer graphics. As the title of #19 reveals, the computer is mentioned as one of the authors of this book: »computer: stochastic graphics«. A machine equally ranking between the artist Nees and author Bense was a provocation which caused irritation: Reinhard Doehl described the exhibition as »turbulent«. 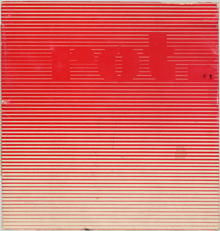 Today, the exhibition as well as »rot #19« are widely regarded as milestones of computer art. The red publications were designed by Walter Faigle. In the 1960s Faigle ran a studio for visual communication and photography in Stuttgart, Germany, and Zurich, Switzerland. 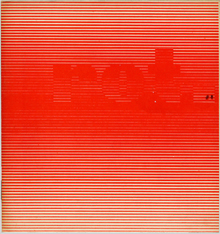 His cover design, shown in the first number of the red brochures from 1960 above, resembles the computer graphics of the years to come. There is an obvious similarity of early computer art to art movements of that time like Op art und Concrete art. As can be seen in Faigle´s cover design, the common ground seems to be the precision and particularly the invisible but noticeable mathematical structure the design is based on - no matter if it is a picture, a text or a piece of music. »There are also red secrets in this world, yes, only red ones.« This Ernst Bloch quote is printed on the back of most red brochures in German. It was taken from the book »Heritage of our Times« which was published by the Marxist philosopher in 1935. There is an interesting and also critical article on Bloch in the German magazine »der Freitag«: Denken als Handgemenge. Bloch´s former assistant Hanna Gekle mentions the special relevance of this book for the analysis of art, literature and philosophy. Like Concrete and Visual poetry, computer-generated texts belonged to the experimental field of the Stuttgart School. From the first stochastic poem in 1959 to the auto-poems (algorithmic poetry) of the 1960s and 70s these computer-generated works are pieces of early computer art. Besides the German website www.stuttgarter-schule.de you can find a lot of information on computer-generated texts and poetry on www.netzliteratur.net, a website also in German, e.g. a chronology of computer texts. A good read is Ralf Bülow´s article on he history of mechanical and digital writings in the catalogue »Ex Machina« by Kunsthalle Bremen.